India especially in Kerala, fish is the staple food. A lunch meal is incomplete without a fish recipe. Here is a delectable ayala roast/mackerel roast in banana leaf wrap. 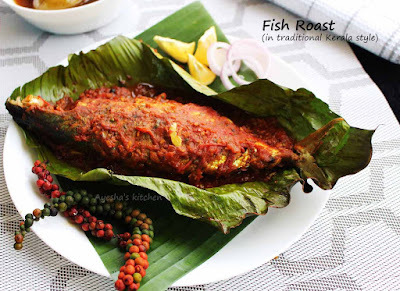 This recipe for the fish roast is a kerala style fish recipe with crushed green pepper corns (pacha kurumulak chathachath). A lovely spicy serving of roasted fish from South India which is absolutely delicious. This fish roast pairs best with hot steamed rice. 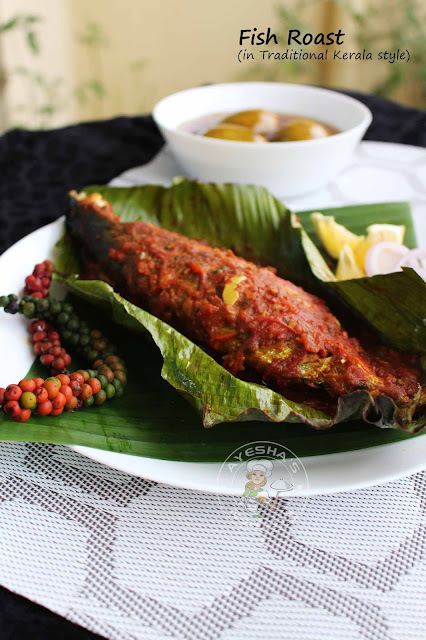 Meen roast/fish roast with pacha kurumulak chathachath is the traditional kerala style fish roast in banana leaf. 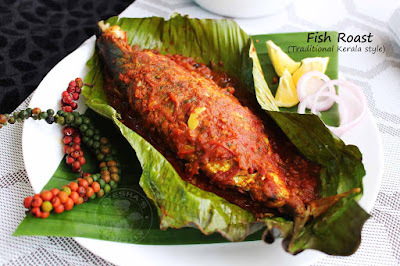 This fish recipe is popularly known as fish pollichath. 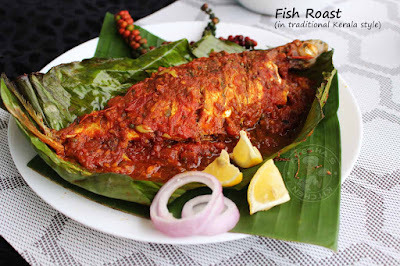 Karimeen pollichath (pearl spot fish pollichath) is the famous kuttanadan fish recipe which is known around the world. Here am with yet another fish pollichath or fish roast with mackerel fish where freshly ground green pepper corns is used as a special ingredients. Clean the fish and dry it well. Make slits in fish and marinate the fish with all the ingredients given under 'for marination'. Keep refrigerated for 1 hour (do not skip). Meanwhile, make the tomato roast. Heat a wok with 2 tbsp of oil. Add the tomato slice, salt and saute well. Cover and cook over a medium flame until mushy. Crush the green peppercorns and garlic cloves well or can coarse grind it. Add it to the sauteed tomato and stir well until the raw smell of garlic disappears(do not skip). Then add chili powder and turmeric powder. Combine well. To this add half a cup of water and let it cook until oil separates. Remove from flame. Heat oil in a pan for shallow frying. Fry the marinated fish until both sides are done. Be careful, do not fry the fish until crispy. Transfer to a plate.Wipe out the excess oil in the pan. Heat the same pan with 1 tsp of oil. Grease the leaf with some coconut oil and place half of the tomato roast on the leaf. Now place the half fried fish and top the remaining tomato roast over the fish. Fold the banana leaf and cook with lid covered. Make the flame to medium-low. Cook for 5 minutes. Flip the wrap and again cook for 5 minutes. When done, serve hot along with hot steamed rice.